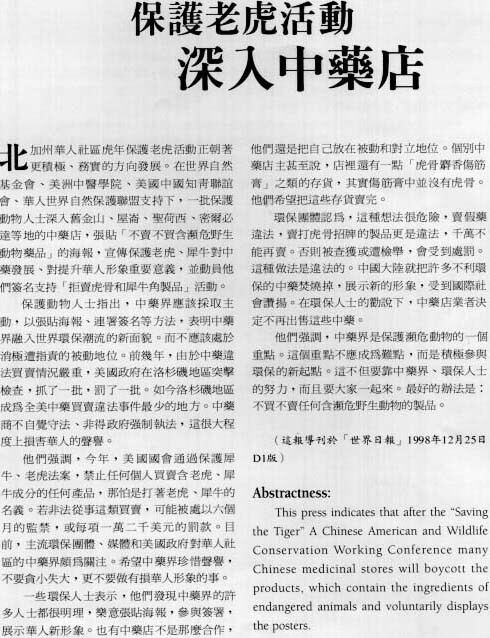 This press indicates that after the "Saving the Tiger" A Chinese American and Wildlife Conservation Working Conference many Chinese medicinal stores will boycott the products, which contain the ingredients of endangered animals and voluntarily display the posters. support. Previous article : Thirty nine oriental medicine schools support "Stop Illegal Trading in Tiger Products & Rhino Horns!" Next article : Letter to Chinese herb dealers.